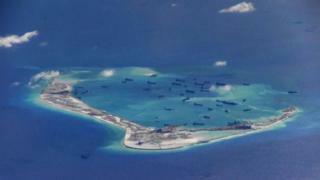 An international tribunal has ruled against Chinese claims to rights in the South China Sea, backing a case brought by the Philippines. China called the ruling "ill-founded" and says it will not be bound by it. The ruling came from an arbitration tribunal constituted under the United Nations Convention on the Law of the Sea (UNCLOS), which both countries have signed. Transient use of features above water did not constitute inhabitation - one of the key conditions for claiming land rights of 200 nautical miles, rather than the 12 miles granted for rocks visible at high tide. The ruling is binding but the Permanent Court of Arbitration has no powers of enforcement. The Philippines has had diplomatic spats with China over the Scarborough Shoal and Spratlys in particular. It says China's "nine-dash line", which China uses to demarcate its territorial claims, is unlawful under the UNCLOS convention. Vietnam, Taiwan, Malaysia and Brunei also have competing claims in the region. Although these islands are largely uninhabited, they may have reserves of natural resources around them. There has been little detailed exploration of the area, so estimates are largely extrapolated from the mineral wealth of neighbouring areas. As expected, China is standing firm and re-asserting its claim to the area. "China's territorial sovereignty and marine rights in the South China Sea will not be affected by the so-called Philippines South China Sea ruling in any way," said Chinese President Xi Jinping. He said China was "determined to maintain peace and stability" and was committed to resolving disputes "through negotiations based on respects to historical facts and according to international laws". China's state news agency Xinhua said that "as the panel has no jurisdiction, its decision is naturally null and void". But Philippe Sands, a lawyer for the Philippines in the case, said it was a "clear and unanimous judgement that upholds the rule of law and the rights claimed by the Philippines". The Philippine government says it is now studying the ruling. However, the BBC's Jonah Fisher, in Manila, says the lack of celebrations may be a result of the recent change of government. Our correspondent says many Filipinos believe newly elected President Rodrigo Duterte may have sought promises of Chinese investment, in return for a quiet, dignified response. The US called the decision an "important contribution to the shared goal of a peaceful resolution to disputes in the South China Sea", and urged all parties to consider it "final and legally binding". Taiwan, which also claims the disputed area, said the ruling had "seriously damaged" its rights. "We hereby solemnly state that we will definitely not accept this ruling," the foreign ministry said. The US sent an aircraft carrier and fighter jets to the region ahead of the decision, while the Chinese navy has been carrying out exercises near the disputed Paracel islands. This result represents a major loss of face for China, and yet the first response from Beijing to the tribunal's demolition of its claims seems be rather conciliatory. On the one hand, the Chinese government has re-stated that it has territorial sovereignty and maritime rights in the area and that the activities of its people there date back to over 2,000 years ago. However, it then goes on to talk about "consultation with the states directly concerned" and proposes "joint development in relevant maritime areas". Airlines and shipping companies will be pleased to hear that China has also restated that it respects "freedom of navigation and overflight enjoyed by all states under international law in the South China Sea" and that it stands ready to ensure "unimpeded access to international shipping lanes". All this seems to point towards Beijing possibly seeking some sort of negotiated settlement rather than ramping up the pressure on the Philippines following Manila's comprehensive victory in The Hague.